Format: Hot Adult Contemporary "K-Jo 105-5"
2000-current - KKJO - Hot Adult Contemporary "K-Jo 105-5"
See the 105.1 listing for the history of KKJO. 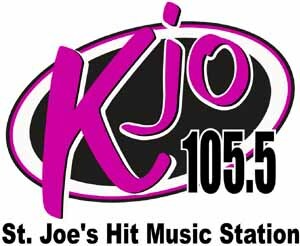 K-Jo 105.5 has resided on 105.5 mHz since April 2000, when a frequency swap allowed 105.1 to move into the Kansas City market. Although KKJO has better Kansas City coverage than before, it's still strictly a St. Joseph station in terms of presentation and advertising. In an era when pre-1980s music is generally frowned upon, KKJO continues to air a locally produced Super '70s Saturday night show. In 2011, KKJO stunted with "It's The End Of The World As We Know It" to coincide with a preacher's rapture prediction.